Leadership Development • Qualia, Inc. Millions of dollars in profits are lost each year due to untapped employee potential. Yet, leaders who inspire people to perform at higher levels by recognizing and removing obstacles can double profits. Gallup studies show that actively disengaged employees cost U.S. companies $450 billion to $550 billion in lost productivity per year, with leadership a direct causal link to low employee engagement. Qualia, Inc.’s unique group coaching leadership development program helps leaders achieve organizational balance. You’ve done the assessments, delivered the competency training and nothing changes! Why is that? Because gaining new knowledge is step #1 of 5 and that’s often where companies stop (head focus). Steps 2-5 involve making new choices and taking new actions, which create a new experience that steps into the new feeling of success (Heart/Gut). Once experienced, your leaders will repeat it, but how to create that experience? Group coaching around the new competency knowledge gained in the leadership training you’ve already delivered is key. This group coaching is based on neuroscience and the behavioral shift model (5 steps from awareness to mastery). It’s about getting leaders into action with their new knowledge and creating experiences of success or learning from their challenges. What if you haven’t delivered that leadership training yet? Let’s talk! There are options and choices to fill this gap as well. 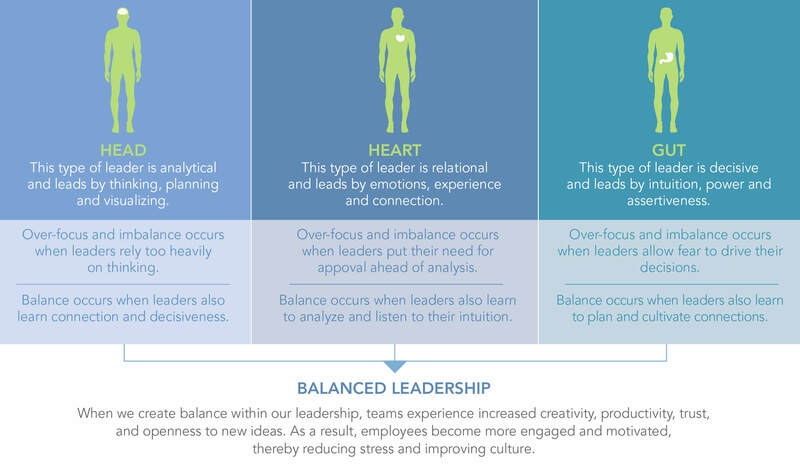 How does this develop balanced, aligned leaders? Understanding the power of and how to invoke all three brains via the neuroscience model around new competency knowledge creates coherent, conscious leadership — leading from the head, from the heart, and tapping into inner wisdom — power and intuition (the gut). Teams start with a full delivery of the proprietary Change Your Mind…Create New Results workshop, based on neuroscience process, model and tools as baseline. The workshop opens up your leaders to new ways of thinking, new choices, and new actions that lead them to become unconsciously skilled in their new leadership competencies. Monthly group coaching sessions follow around the leadership competencies you have already trained on, utilizing the neuroscience model learned in the baseline workshop. Each 4-hour monthly session consists of accountabilities/review of action items from the previous month, review of the current month’s competency skills, group coaching in applying the neuroscience model to that competency, and ending with creating a new action plan for the following 30 days. As mentioned, if you haven’t already delivered that leadership training, we can work together to figure out which leadership competencies need strengthening. We’ll determine how to create/customize/deliver the content and tools for your teams. Group coaching sustainability process follows after leadership training. “While it is unrealistic to expect workers to be 100% productive through every working day, Blanchard believes that most organizations are operating with a 5-10% productivity loss that better leadership practices could eliminate. Using data from a Situational Leadership® II implementation involving 300 managers and 1,200 direct reports at a large financial services firm, this study showed that the organization achieved a 5-12% increase in productivity among direct reports of managers who attended the leadership development training and became better leaders using the new skills they had learned. What would a 5-12% increase in productivity net your organization’s bottom line? Contact Suzanne for a complementary 30-minute strategy session to brainstorm possibilities. What might the bottom line impact be to your organization in terms of increased engagement, productivity, and creativity? How might you achieve a performance and values-driven culture as a result of introducing these tools into your organization?